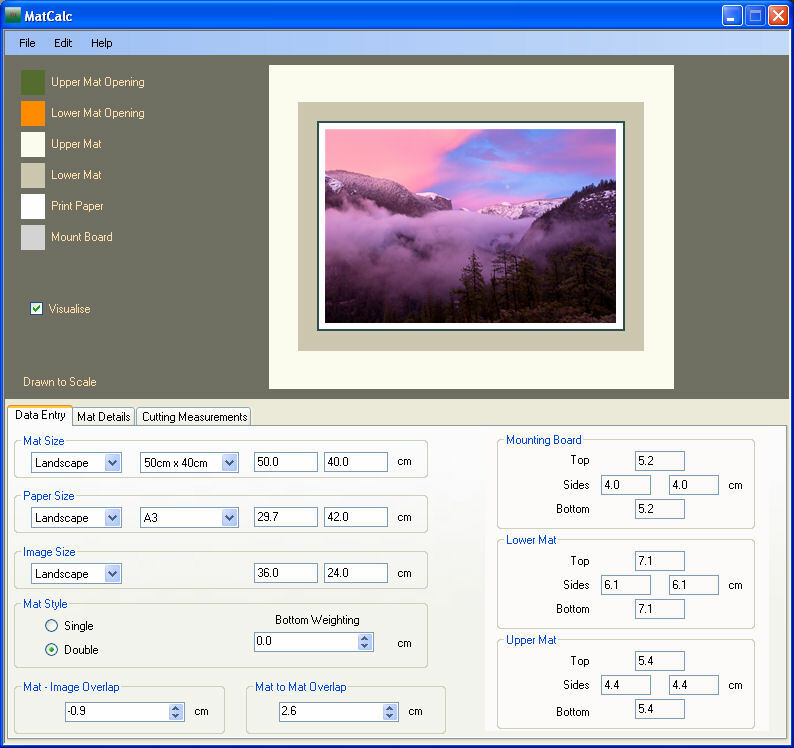 The application window (click the image to the left for an enlarged view) is divided into several areas, the usual menu bar along the top, below this is a visualisation area and the lower half of the window is a data region comprising three separate tabs; Data Entry, Mat Details and Cutting Measurements. Each of these areas will be discussed below by way of a double matted example. Once you understand the operation for a double mat, mounting with a single mat should be self explanatory as by selecting ‘single mat’ style, the unused second mat items are greyed out. File – Load: Loads a set of sizes from hard disk to save you time entering your standard set each time. File – Save: Saves the current size data to disk. Enables you to save your favourite setups. File – Print: Not implemented yet. Edit – Units: Check the tick box to select either imperial(inches) or metric (centimetres) units. The resolution of MatCalc in Metric is 0.1cm (1mm) and when in Imperial is 1/16th inch. Help – Overview: Takes you to the on-line application overview page at the Zone-XI website. Help – Manual: Takes you to the on-line help page at the Zone-XI website (this page). Help – Donate: Takes you to the donate page where you can make a donation via PayPal to the author if you find the program useful. Help – About: Pulls up the ‘about’ box with version data. On the left of this region of the display is a key with colour swatches showing how each of the elements will be displayed. Below the key there is a tick-box marked ‘Visualise’. The default condition is un-ticked. In the centre of this region is the main viewing area which is drawn to scale. The default view is shown in the figure below, it shows the printed image on white paper resting on top of the mount board. Another way of thinking about this view is that you are looking through transparent mats to see how it all lines up. Overlaid on this are two rectangles representing the openings in the mats, the inner orange rectangle being the cut-out for the lower mat (single mat) and the green rectangle being the cut-out in the top mat (when you use double mats). Thus the orange rectangle shows you how much of the image will be covered up my the mat and thus you should take this into account when you crop your image during post-processing. When the ‘Visualise’ box is ticked, the display changes to show what the finished mounted print will look like in the right colours (see figure below). This is a very useful view as I for one, find it hard to imagine how the finished mounted print will look; the size of the border due to the lower mat and its colour are essential in the overall impression of the artwork. The interested reader should consult other published material in order to understand how important mat dimensions and colour are to present the artwork in the best light. The need to visualise this before one starts cutting was the main reason to write this application. 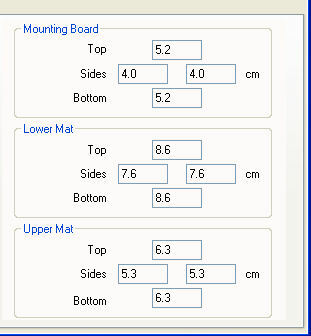 Refer to the figure below; the first thing we need to do is to set the sizes of the mat, the paper and the image, the units are shown and if you need to change from imperial to metric or vice-versa, go to EDIT, UNITS from the main menu at the top. It is possible to have mat, paper and image with different orientations, but it is more common to have them all the same. The next spin-box for mat/paper allows you to select pre-configured common sizes, if the one you require isn’t listed, merely type your size in the two further boxes. There is no concept of width and height, as the application will determine what you mean from the orientation. The application will sanitize your data and if you try to do something illogical, a warning message box will appear, just hit ‘OK’ to clear it. The next thing to configure is the mat style, single or double matting is supported and for most applications, single matting will be sufficient. For those special prints, tastefully done double matting gives the finished mounted print that little bit more style, the choice of mat colours enhancing the artwork. When ‘single mat style’ is selected, irrelevant parts of the window are greyed-out, selecting ‘double mat style’ again brings them back. With zero bottom-weighting, the distance above and below the image is the same. I should say for completeness, that the distance to the left and right of the image is always the same. 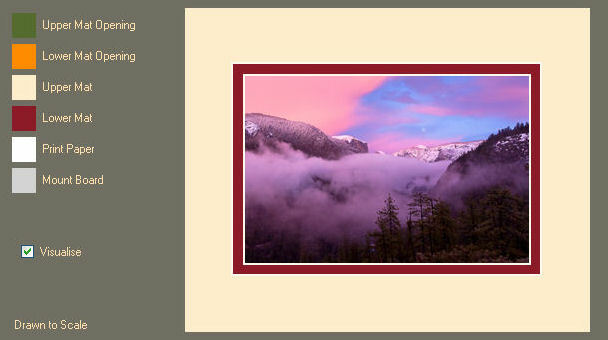 Positive bottom weighting moves the image up making the bottom border larger than the top. Negative bottom-weightings cause the opposite, but in my opinion, this should rarely be used. One common attractive border scenario is to have the bottom border largest, and the top equal to the side border. Experiment with this spinner to see what looks good for you. In order to help alignment of the mat over the image, it is prudent to allow some overlap, usually 2mm or 3mm is sufficient. 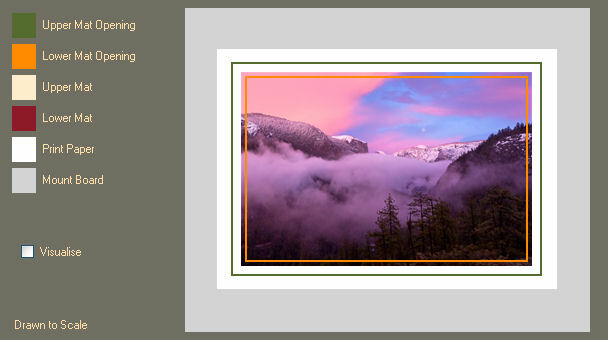 During post-processing when you’re cropping the image, don’t forget to allow for this loss of the edges of your image due to the mat overlap. If you would rather see some of the white paper as a border around your image, use a negative value for the ‘Mat-Image Overlap’. In the case where you want a double-mat, set the mat-to-mat overlap value to set the cut-out in the upper mat; which therefore sets the amount of lower mat showing. The upper mat must have a larger cutout than the bottom mat. This control is greyed-out if you select single-mat style. The right part of this window (see left) gives a preview of the cutting data. This provides useful information; for example when you adjust the bottom-weighting control you can compare the border dimensions of the top and sides. Selecting the ‘Mat Details’ tab, the lower window changes to that as shown below. The coloured swatches to the right are only there to show you which colours are supported, clicking them has no effect. To the left, you can independently set the upper and lower mat colours, and whether the bevels are white or black. Usually mat boards are white/cream inside but there are a few coloured mounting boards that are made from a black material so when cut, show a black bevel. This can be very effective especially if you use a negative mat-image overlap to expose some white paper. 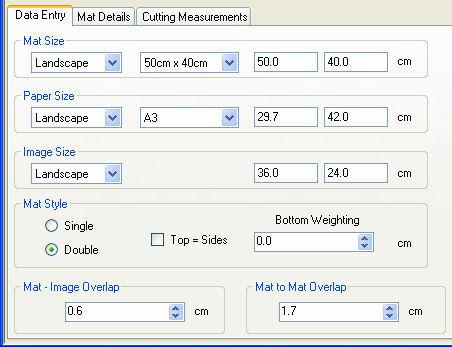 Selecting the ‘Cutting Measurements’ tab, the lower window changes to that as shown below. There are no user controls here, the information provided gives the measurements needed to mark out each board for cutting. Please refer to the manufacturers data for cutting methods. The use of a mouse with a central wheel is useful as the combo-box selections can be adjusted by moving the wheel. The number of steps that the combo-box changes is a function of how you have set up your mouse. I’ve set my mouse to scroll one step at a time and so fine adjustment of the mat is possible.